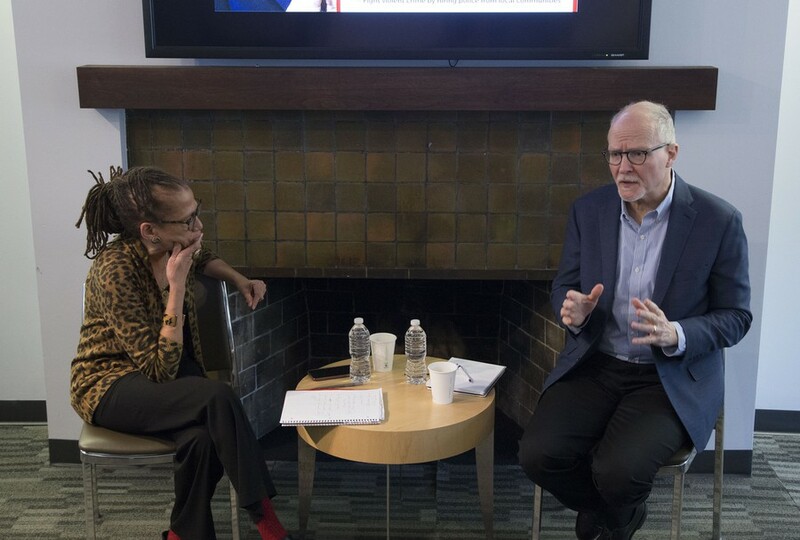 Institute of Politics (IOP) Pritzker Fellow Laura Washington, a Chicago Sun-Times columnist and political analyst for ABC7, spoke with mayoral candidate Paul Vallas about his election platform at the IOP on Monday. This is the first of the IOP’s discussions with 2019 mayoral candidates, as part of its Chicago Elections Project. At the event, Vallas cited his experience as a former Chicago Public Schools (CPS) CEO and City Hall budget director as evidence that he is best qualified to solve the City’s deep budget crisis. “Because I left,” Vallas answered, to some laughter. Vallas also criticized the Daley administration for being shortsighted, choosing year-to-year budgeting over long-term planning, entering into unaffordable bargaining agreements, selling City assets to balance budgets temporarily, and ending funding for the pension program. When asked about his strategy for solving these issues, Vallas responded that his plan was to fund the pension system and balance the budget by increasing the capital gains tax. He also identified the real estate transaction tax as a good opportunity to increase revenues and said that $150 million could be generated by getting rid of the City’s unnecessary contractual expenditures.